Does Washington, in this letter, sound like he is talking about Christianity alone? The liberty enjoyed by the people of theses states of worshiping Almighty God agreeably to their consciences, is not only among the choicest of their blessings, but also of their rights. While men perform their social duties faithfully, they do all that society or the state can with propriety demand or expect; and remain responsible only to their Maker for their religion, or modes of faith, which they may prefer or profess. Did the First Amendment Make America a Christian Nation? David Barton on Thomas Jefferson – Did Jefferson approve church in the Capitol? And I’ll give you a great example. We moved into the US Capitol in 1800, November of 1800. And when we moved in, one of the first acts of Congress was to approve the use of the Capitol as a church building. You can find that in the records of Congress, Dec 4 1800. Now, who did that? You had the head of the Senate and the head of the House, the speaker of the House was John Trumbull, the president of the Senate who approved that was Thomas Jefferson. Thomas Jefferson approves church in the Capitol? Yep, he went there as Vice President, he went to the church at the Capitol for 8 years as President, and as President of the US, he’s going to church, and this is recorded in all sorts of members of Congress, their records, their diaries, because they went to church at the Capitol too. And so, Thomas Jefferson, President of the United States, thinks, you know I think I can help the worship services at this new church at the Capitol, they met in the Hall of the House of Representatives, so Jefferson ordered the Marine Corp band to come play for the worship services, in the church services at the US Capitol. The worship band is the Marine Corp Band? Pretty good worship band. Thomas Jefferson did that. I thought he wanted separation of church and state. If you read his letter on separation of church and state, he said separation of church and state, he makes it very clear, separation of church and state will keep the government from stopping a public religious activity. Note that the Speaker informed the assembled representatives that the Chaplains proposed to hold services in the Chamber. Apparently, it was agreeable to the House of Representatives since there is no recorded objection or vote on the matter. The Senate chaplain was Dr. Thomas John Claggett, an Episcopalian, and the House chaplain was Rev. Thomas Lyell, a Methodist. Both had begun their appointments in November, 1800. Barton said that John Trumbull was the Speaker of the House but it was Theodore Sedgwick who raised the matter to the House on December 4, 1800. Jefferson was indeed President pro tempore of the Senate. However, according to the records of the Senate that same day (general business and the executive committee), nothing was mentioned about use of the Capitol building as a church. In fact, the Senate did not need to approve the matter since the request came to the House for their Chamber. I can find no vote, affirmation or acknowledgement by the Senate. Unless Barton can demonstrate otherwise, it is incorrect to say that Thomas Jefferson approved, in some official manner, church services in the Capitol. At the same time the speaker’s desk in the hall of the house of representatives Sunday after Sunday was a forum from which was presented a wide range of religious belief. The chaplains of congress officiated there, as did also ministers representing various denominations. Frequently the religious atmosphere was lacking, sometimes due to the audience turning the occasion into a social function and then again to the eccentric character and views of the preachers. Rev. Manasseh Cutler was not pleased with the discourse of Rev. John Leland, who arrived in the city January, 1802, with the mammoth cheese which was presented to President Jefferson. On the following day he officiated at the capitol. The president was in the congregation, as it was his custom to be in the early years of his administration. Incidentally, John Leland was one of the fiercest proponents of religious freedom and personally lobbied James Madison for a religious liberty clause in the Bill of Rights. The whole thing sounds religious in the general sense but not doctrinaire. One of sources of information about Jefferson, the Capitol church forum and the Marine band is a book by Margaret Bayard Smith, wife of a newspaper publisher. The book is a free ebook via Google and can be read there. I am producing a lengthy section titled Jefferson at Church from her book. At this time the only place for public worship in our new-city was a small, a very small frame building at the bottom of Capitol-hill. It had been a tobacco-house belonging to Daniel Carrol1 and was purchased by a few Episcopalians for a mere trifle and fitted up as a church in the plainest and rudest manner. During the first winter, Mr. Jefferson regularly attended service on the sabbath-day in the humble church. The congregation seldom exceeded 50 or 60, but generally consisted of about a score of hearers. He could have had no motive for this regular attendance, but that of respect for public worship, choice of place or preacher he had not, as this, with the exception of a little Catholic chapel was the only church in the new city. The custom of preaching in the Hall of Representatives had not then been attempted, though after it was established Mr. Jefferson during his whole administration, was a most regular attendant. The seat he chose the first sabbath, and the adjoining one, which his private secretary occupied, were ever afterwards by the courtesy of the congregation, left for him and his secretary. I have called these Sunday assemblies in the capitol, a congregation, but the almost exclusive appropriation of that word to religious assemblies, prevents its being a descriptive term as applied in the present case, since the gay company who thronged the H. R. looked very little like a religious assembly. The occasion presented for display was not only a novel, but a favourable one for the youth, beauty and fashion of the city, Georgetown and environs. The members of Congress, gladly gave up their seats for such fair auditors, and either lounged in the lobbies, or round the fire places, or stood beside the ladies of their acquaintance. This sabbath day-resort became so fashionable, that the floor of the house offered insufficient space, the platform behind the Speaker’s chair, and every spot where a chair could be wedged in was crowded with ladies in their gayest costume and their attendant beaux and who led them to their seats with the same gallantry as is exhibited in a ball room. Smiles, nods, whispers, nay sometimes tittering marked their recognition of each other, and beguiled the tedium of the service. Often, when cold, a lady would leave her seat and led by her attending beau would make her way through the crowd to one of the fire-places where she could laugh and talk at her ease. One of the officers of the house, followed by his attendant with a great bag over his shoulder, precisely at 12 o’clock, would make his way through the hall to the depository of letters to put them in the mail-bag, which sometimes had a most ludicrous effect, and always diverted attention from the preacher. The musick was as little in union with devotional feelings, as the place. The marine-band, were the performers. Their scarlet uniform, their various instruments, made quite a dazzling appearance in the gallery. The marches they played were good and inspiring, but in their attempts to accompany the psalm-singing of the congregation, they completely failed and after a while, the practice was discontinued,—it was too ridiculous. So Jefferson and the Marine Band were in the same church services. The Marine Band did play, but there is no evidence that he ordered the Marine Band to play. Jefferson attended the services but there is no evidence that he approved them officially. If anything, it sounds like they were ecumenical events with all sects and groups allowed to speak. This is a situation which generally supports the idea that religion in some general sense was supported by the politicians of the time. It seems unnecessary for Barton to embellish the narrative. I should hasten to add that I would be happy to issue a correction if Mr. Barton or any reader has evidence that Jefferson had some role in approving the services or ordering the Marine band to play. Was the Jefferson Bible an evangelism tool? Author Warren ThrockmortonPosted on April 27, 2011 Categories david barton, dominionism, politics, ReligionTags capitol church, david Barton, marine band, Religion, thomas jefferson44 Comments on David Barton on Thomas Jefferson – Did Jefferson approve church in the Capitol? Will this calm the birther storm???? The President is releasing his long form birth certificate today. Trump and Franklin Graham may have pushed the right/wrong buttons. So will this calm the storm? Open forum – what will the new objections be? What will birthers say about this development? And what new and startling findings will we see? Been pretty serious around here for a spell, let’s have some fun with this. Author Warren ThrockmortonPosted on April 27, 2011 Categories Cultural news, politicsTags birth certificate, birthers, hawaii, president obama54 Comments on Will this calm the birther storm???? He told me this months ago, but Bahati seems to be wanting to get some attention back on Uganda’s Anti-Homosexuality Bill. at 11:25 on April 26, 2011, EDT. KAMPALA, Uganda – The Ugandan parliamentarian behind an anti-homosexual bill that attracted worldwide condemnation says the most controversial part of the proposed legislation — the death penalty provision — is likely to be dropped. David Bahati says if the committee the bill currently sits before recommends that the provision be removed, that he would concede the issue. Stephen Tashobya, the chairman of the parliament’s Legal and Parliamentary Affairs Committee, said Tuesday that he would try to bring the bill up for a vote before parliament’s current session ends May 12. After Bahati’s bill was proposed in 2009, it attracted international condemnation, including from President Barack Obama. The bill has since languished in committee. UPDATE: The full AP article is much longer than this short version. It does sound like Stephen Tashobya intends to get the bill a vote. Given the information, I have been getting from close to the Cabinet, this will not be viewed favorably by the ruling party. An alternative view is that a focus on homosexuality might take the minds of the people off of the recent riots and arrests of opposition party leaders. The actual quote out of all three acts was “to propagate the gospel among the heathen.” Now, when you take the context of those three federal acts, and you know, you can check the acts, March 3rd, 1803, March 19, 1805, I can give you the dates, you can look them all up and read it. It says, ‘for propagating the gospel among the heathen.’ Now this is not a territory exchange, by the way, and even if it were, let’s say the United States today makes some kind of territory exchange with the Cherokee tribe in North Carolina, or Oklahoma, what do you think happens if the federal government puts in money to pay a Catholic priest, or to build a Catholic church, even if that’s what the Cherokees want? 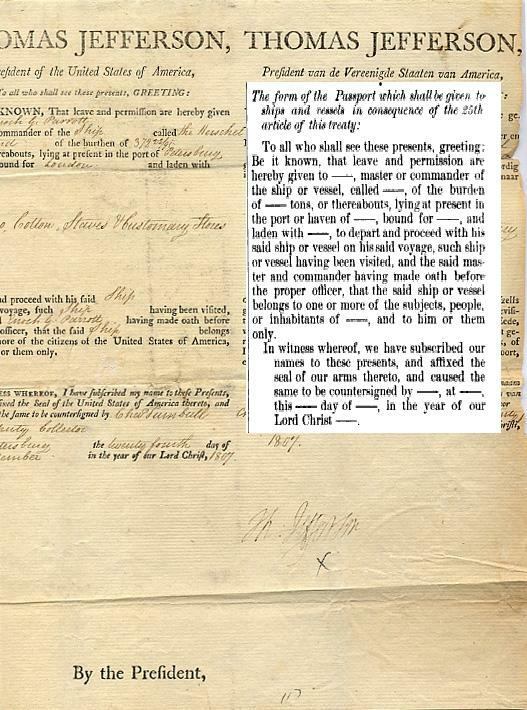 Note the the 1796 bill, enacted when George Washington was President, was titled, “An Act regulating the grants of land appropriated for Military services, and for the Society of the United Brethren, for propagating the Gospel among the Heathen.” (Click the link to see the entire Act). Over a decade after the Delaware converts and the Brethren missionaries had been displaced to Northern Ohio, the Congress made arrangements for the Society of Brethren to take trust of the land on behalf of the Christian Indians. As the language of the Act makes clear the phrase “propagating the gospel among the heathen” was a part of the legal name of the responsible organization. As I noted last Thursday, Jefferson later renewed the act for the purposes of providing new law relating to military lands, with nothing new regarding the Brethren or the Christian Indians. The Society’s name remained in the title of the Act, which is apparently where David Barton comes up with his claims about Jefferson. Once the original act was signed by Washington, the Brethren went to work trying to rebuild the mission in Eastern Ohio. Eventually, the Society ceded the land back to the federal government because the converts did not return in sufficient numbers to make the mission viable. The narrative developed by Barton is misleading and obscures the situation. All Jefferson did was approve bills that had a religious society’s name attached to the title. I am reviewing this again because I continue to be bothered by Barton’s appropriation of this story as evidence for his view of Christian America. This bothers me for at least two reasons. First, he does an injustice to the historical record which includes the initial Northern relocation of peaceful elements of the Delaware tribe, and the massacre at Gnadenhutten. The Christian converts were marched to Northern Ohio and left there without provisions. Then when a group returned to Gnadenhutten to find food, they were brutally killed by the Pennsylvania Militia. The Society of the Brethren had to constantly bring the horrible treatment suffered by the native people to the attention of the “Christian nation” in order for even the most basic of response, years later. Barton’s narrative misrepresents the role of federal government and minimizes the Gnadenhutten atrocity. Second, Barton complained on the Paul Edwards program that liberals would protest if the federal government today used funds for religious purposes with Native Americans, apparently oblivious to the fact that the federal government pushed Christianity on Native American tribes until early in the 20th century. Native children were removed from their families in elementary school and sent away to boarding schools, sometimes run by church groups. They were forbidden to speak their language or follow native customs. Some recall harsh punishments if the rules were violated. Even Christian Native Americans say that the treatment was demeaning. By using the treatment of Native Americans as evidence for his vision of Christian America, Barton inadvertently demonstrates at least one peril of his construction. Next: Did Jefferson authorize the Capitol for church services and/or order the Marine Band to act as a worship band? Yesterday, David Barton and I were on the Paul Edwards radio program, although at different times. Mr. Barton did not want to be on the show at the same time, so he went first and responded to my series on Jefferson and then I followed. The podcast is here (April 20 show) which contains the entire program (start at about 1:23:23 for both segments). During the program, Barton said that the difference in our views on the Kaskaskia tribe treaty was related to semantics. He believed that federal funds being used for the subsidy of a priest was significant even though the funds were given to a sovereign nation. However, I maintain that it is simply misleading to say that Jefferson approved funds to evangelize the tribe when the tribe was already predominantly Catholic. Then Barton said that I might be unaware that Jefferson also approved assistance to the Moravians “to propagate the Gospel among the Heathen.” I was aware of this situation and want to report some of what I found. The story of the Christian Indians in Ohio is a long one and quite involved. I am going to describe the situation as briefly as possible. Let me start at the end. In 1823, Indian converts to Christianity affiliated with the United Brethren church ceded three tracts of land to the government. You can see a copy of the Schedule of Indian Land Cessions here. Note the information regarding the “Moravian or Christian Indians.” The information is also archived on the Library of Congress website. Where or how concluded: Act of Congress. Reference: Statutes at Large, Volume III, page 749. Tribe: Moravian or Christian Indians. Historical data and remarks: An ordinance of Congress of Sept. 3, 1788, set apart three tracts of 4,000 acres each at Shoenbrun, Gnadenhutten, and Salem, on Muskingum river, for the Society of United Brethren, to be used in propagating the gospel among the heathen. By act of Congress approved June 1, 1796, provision was made for surveying and patenting these tracts to the society in question, in trust for the benefit of the Christian Indians. Under the provisions of the act of Mar. 3, 1823, Lewis Cass was appointed to negotiate for the relinquishment of the title to the U. S. This he secured and transmitted the relinquishment of both the society and the Indians to the War Department, under date of Nov. 19, 1823, and by act of May 26, 1824, Congress made provision for the disposition of the lands. At first glance, it does appear that the government in 1788 set apart land in Ohio “to be used in propagating the gospel among the heathen” by the Society of United Brethren. Indeed, the government did authorize land to Indian converts of missionaries from the United Brethren church. However, this initially was done for the purpose of returning them to land which rightfully belonged to them. One can read the full history of the Delaware tribe converts here. Essentially, the United Brethren church had a long history of mission work among various tribes in Pennsylvania, much of it conducted by David Zeisberger. Facing a need to move his work westward, Zeisberger and some of his converts traveled to what is now eastern Ohio, near New Philadelphia in 1772. The Brethren mission was successful in that other settlements of native converts were established. However, they soon became embroiled in conflicts with the Americans and the British during the Revolutionary War. While the mission communities wanted to remain neutral, both sides along with other Indian tribes distrusted the “Christian Indians” as they came to be called. The situation was so bad that by 1781, the settlers were relocated near Sandusky. In 1782, some of the Indians returned to Gnadenhutten, Then, in March, a group of Pennsylvania militiamen attacked the mission at Gnadenhutton, killing all men, women and children. The residents of the mission were unarmed and taken captive by stealth, in a particularly gruesome atrocity. I received by last post your letter of the 4 of March, and have to inform you that agreeably to my promise I laid your Memorial before Congress on the first of November last. It was then read and referred to a Committee, who reported thereon the 31 of March. (1) I presume the unsettled state of Congress and the want of a full representation rendered it in their opinion unnecessary to report sooner. The report is favourable. It has been read and now lies before Congress for their determination but at what time they will take it up I cannot say. It might not be amiss to write to some of the delegates of Pensylvania or of any other state you may be acquainted with and engage them to bring it forward. (2) You may rest assured I shall as far as in my power favour the cause of those unhappy people and most heartily wish your laudable endeavours to promote their spiritual and temporal Welfare may be crowned with success. I am, Sir, Your obedt humble Servt. 1 For the committee report on Ettwein’s October 31, 1783, memorial to Congress on the plight of the Moravian Indians in the aftermath of the Gnadenhutten massacre of March 1782, see Committee of Congress Draft Resolve, March 31, 1784. Ettwein’s. Whereas the United States in Congress Assembled have by their ordinance passed the 20th May 1785 among other things Ordained “that the Towns Gnadenhutten, Schoenbrun and Salem on the Muskingum and so much of the lands adjoining to the said Towns with the buildings and improvements thereon shall be reserved for the sole use of the Christian Indians who were formerly settled there, or the remains of that society, as may in the judgement of the Geographer be sufficient for them to cultivate”. 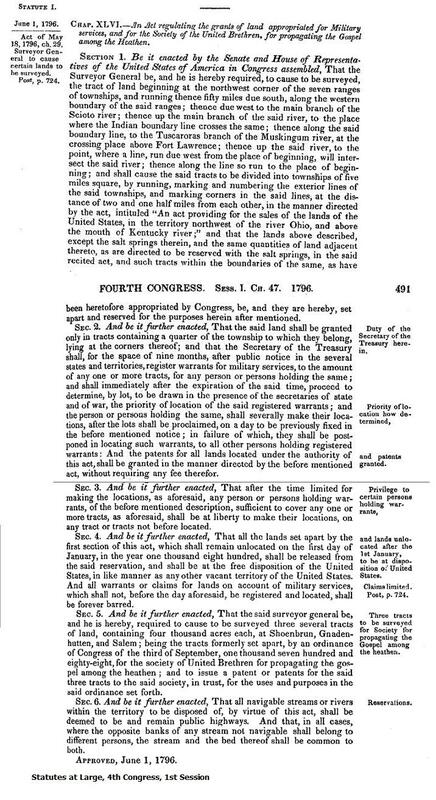 Resolved That the board of treasury except and reserve out of any Contract they may make for the tract described in the report of the Committee which on the 23d instant was referred to the said board to take order, a quantity of land around and adjoining each of the before mentioned Towns amounting in the whole to ten thousand acres, and that the property of the said reserved land be vested in the Moravian Brethern at Bethlehem in Pennsylvania, or a society of the said Brethern for civilizing the Indians and promoting Christianity, in trust, and for the uses expressed as above in the said Ordinance, including Killbuck and his descendants, and the Nephew and descendants of the late Captain white Eyes, Delaware Chiefs who have distinguished themselves as friends to the cause of America. In the year 1787 an event took place, which seems to promise much for the future service of the mission among the Indians. A society called The Society of the United Brethren for propagating the Gospel among the Heathen, in imitation of the Society for the furtherance of the Gospel established by the Brethren in England forty-six years ago. This society consists of all the elders and ministers of the congregations of the United Brethren ia North America and many other members chosen at their request and with the consent of the Society. They held their first meeting on the 21st of September 1787 at Bethlehem inPennsylvania, and February 27,1788, this society was declared and constituted a body politic and corporate by the state of Pennsylvania. The Society was referred to in future legislation which makes it seem as though the federal government continued to support evangelization of the Delaware. As I demonstrated, however, the actual purpose of the government intervention was to protect the property rights of the Bethren converts, a group which had been brutalized by the Pennsylvania militia. The Gnadenhutten massacre required a just and reparative response. Eventually, Thomas Jefferson signed reauthorizations of this act (which also included regulations for military land) which is source of the claims that Jefferson authorized Christian evangelization of the Indians. For instance, he signed this bill which contained the Society’s name and for all the world makes it seem as though Jefferson was supporting the Brethren’s evangelism. However, if you review the bill, there is nothing in it about Indians or religion, beyond the title of the bill. The first bill accomplished two purposes, one relating to military land, the other relating to the Delaware tribe. Once the reparations were accomplished, the bill retained the same name but the content was about the military land tracts. Read it and see. The title of the bill retained the reference to the Society but no additional funds were authorized for religious purposes. So when Barton says that Jefferson signed bills authorizing the “propagation of the gospel to the heathen,” he is not telling the whole story. Some might think this is a minor point. However, I am really troubled that Barton did not tell the whole story of the Gnadenhutten massacre and the real purpose of the involvement of the federal government with the United Brethren and the Christian Indians. By making these bills about Jefferson and his alleged support for religion, Barton minimizes an atrocity committed against native people. When one examines this episode in context, it is clear that the federal government did not simply decide to give money to the United Brethren in order for them to “propagate the gospel among the heathen.” The federal government gave a trust to a group of people who organized as “The Society of the United Brethren for propagating the Gospel among the Heathen” for the purpose of helping the brutalized Indians return and keep rights to their lands. If there had not been a displacement, or an atrocity, there would have been no need for federal involvement in this case. For an even more detailed account of the story see Chris Rodda’s book, Liars for Jesus. Since I started this series, several readers have referred me to her book. I resisted reviewing it until today because I wanted to do my own research. I did however, consult her chapter on the Brethren and found it corresponds to what I found but reports much more detail and background. You can also catch the audio in a blog post at Right Wing Watch which reported on the Paul Edwards program as well. Next (probably next week), what was Jefferson’s role in church services at the US Capitol? Yesterday, I addressed David Barton’s claim that Thomas Jefferson authorized funds to evangelize the Kaskaskia Indian tribe. What he actually did was sign a treaty which provided funds to the tribe to help build a church and help fund the services of a Catholic priest for a brief period. The 200 or so Kaskaskia Indians were already predominantly Catholic and the funds amounted to part of a transaction in exchange for their land. 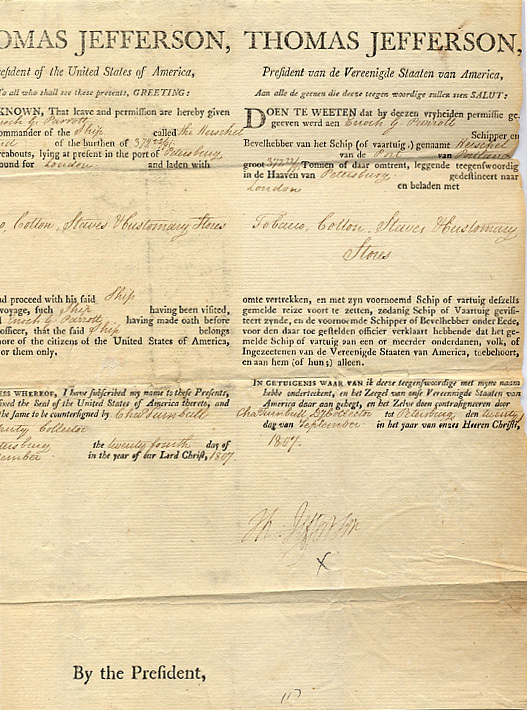 Following is an original document in our possession, signed by Thomas Jefferson on September 24, 1807. This document is permission for a ship called the Herschel to proceed on its journey to the port of London. 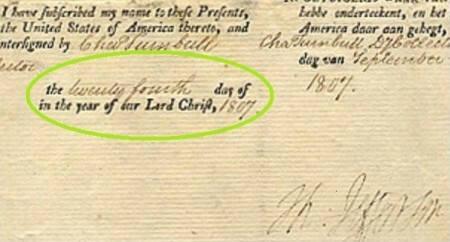 The interesting characteristic of this document is the use of the phrase “in the year of our Lord Christ.” Many official documents say “in the year of our Lord,” but we have found very few that include the word “Christ.” However, this is the explicitly Christian language that President Thomas Jefferson chose to use in official public presidential documents. You can click the document to see the portion Barton has placed on his website. The English part is not completely visible, while the Dutch component is. I have enlarged the section which contains the phrase in question. 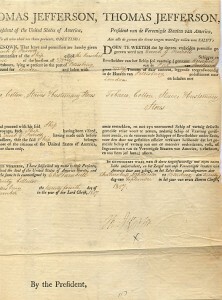 Jefferson did indeed sign this sea letter allowing safe passage for the Herschel to travel to London. However, Jefferson did not choose the “explicitly Christian language” in this document. This particular image comes from a book titled Reports of Cases Argued and Decided by the United States Supreme Court, compiled by a New York lawyers group in 1882. The treaty referred to here was signed with Holland in 1782, the same year Holland became the second nation, after the French, to recognize the independence of the fledgling United States. England had declared war with Holland in 1780. Art. 10. The merchant ships of either of the parties, coming from the port of an enemy, or from their own, or a neutral port, may navigate freely towards any port of an enemy of the other ally; thev shall be, nevertheless, held, whenever” it shall be required, to exhibit, as well upon the high seas as in the ports, their sea-letters and other documents, described in the twenty-fifth article, stating expressly, that their effects are not of the number of those which are prohibited, as contraband: and not 35*] *having any contraband goods for an enemy’s port, they may freely, and without hindrance, pursue their voyage toward the port of an enemy. Nevertheless, it shall not be required to examine the papers of vessels convoyed by vessels of war, but credence shall be given to the word of the officer who shall conduct the convoy. The language is the same. Jefferson was bound by treaty to use this form and did not choose to use this “explicitly Christian language.” John Adams is credited with negotiating the treaty but given the frequency of the phrase in other French treaties and documents of the era, my assumption is that the language was considered standard. Many early Canadian documents also used the phrase, but I doubt Mr. Barton would make the same religious attributions to the signers of those documents that he does in the case of Jefferson. Next: Did Jefferson approve church services in the Capitol and order the Marine Band to play for them? The Ugandan government is cracking down on peaceful protests by arresting opposition leaders, including some who opposed President Museveni in the recent February election. KASANGATI, Uganda — Police in Uganda battled protesters for the third time in a week and again arrested the country’s top opposition politician on Monday, and the Red Cross said one protester died after being tear gassed. Police arrested Kizza Besigye and about a dozen members of parliament while trying to walk to work. Police spokeswoman Judith Nabakooba said Besigye was arrested for trying to hold a political demonstration. Besigye was arrested twice last week while trying to walk to work to protest the high cost of gas and food. Last week violence broke out during his second attempt and he was shot in the hand by police. Besigye took second place in Uganda’s February presidential election to President Yoweri Museveni. A leader in Besigye’s political party, the Forum for Democracy, said Monday’s arrest was unfair. “He has a right to walk if he wishes so,” Ann Mugisha said. High fuel and food prices are blamed for the unrest. Armed security personnel were out in force in Kampala, Uganda’s capital. But a member of parliament and a coordinator of the walk to work, Mathias Mpuuga, said the walks would continue despite the response from security forces. “We will continue to walk to our places of work as a sign of solidarity with common Ugandans who are suffering from high fuel and food prices,” said Mpuuga. The price of maize in Uganda has risen 114 percent over the last year, according to a World Bank report released last week.